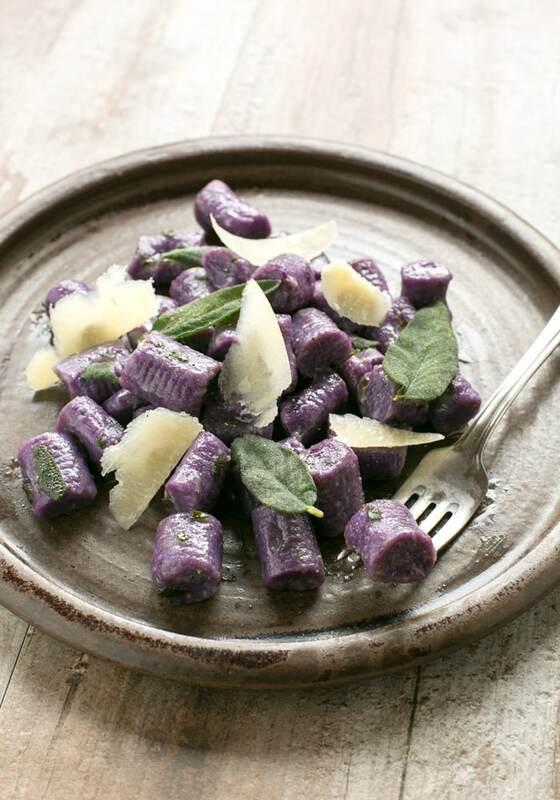 Simple, quick but totally delicious and satisfying – This classic Italian Purple Potato Gnocchi with Sage and Butter recipe only requires 4 ingredients and 15 minutes to make! Since becoming a new parent three months ago, I’ve become a MASSIVE fan of quick meals. Any recipe ready in less than 20 minutes is what is working for the family at the moment. Fear not though, as quick meals don’t necessarily mean boiled rice and veggies. I mean tasty drooling recipes that take a snap to prepare but look like you spent ages in the kitchen. 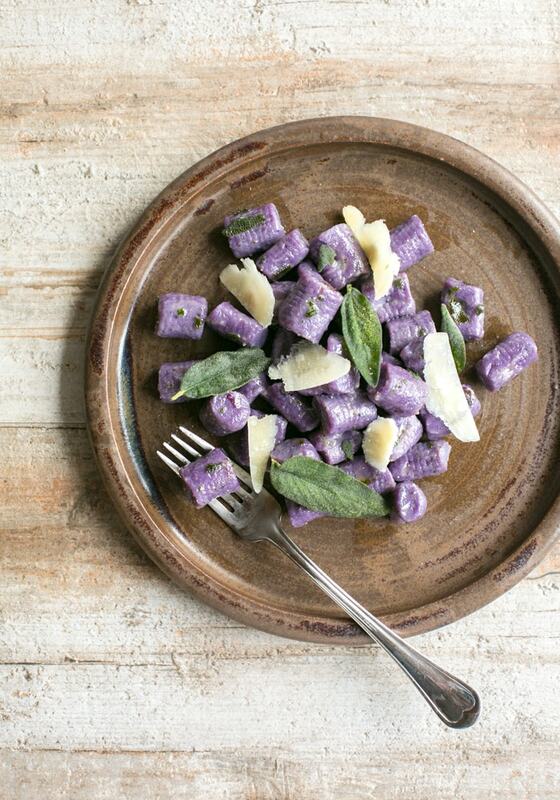 And these Purple Gnocchi with Sage and Butter definitely fit the bill. 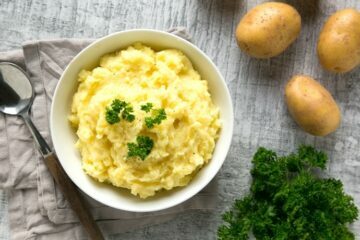 This is an easy meal you can throw together so quick it’s almost unbelievable! OK, I’m cheating a little bit here, as homemade gnocchi do need a bit more than 15 minutes to make. 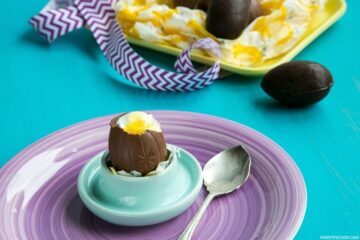 But I usually make a big batch on weekends and freeze them straight away, so that we always have few portions available to enjoy during the busy weekdays. 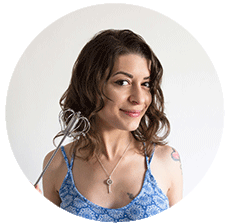 But if you’re in a rush, you may obviously use store-bought gnocchi instead, I won’t judge! Now, let’s focus on this awesome gnocchi with sage and butter recipe. This is such a classic Italian dish, and possibly one of the easiest honestly. 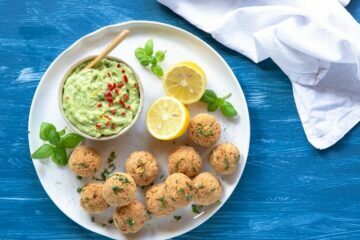 There’s something magical about Italian cuisine – Italians have the ability to turn few simple ingredients and make up outstanding, bursting with flavour dishes. 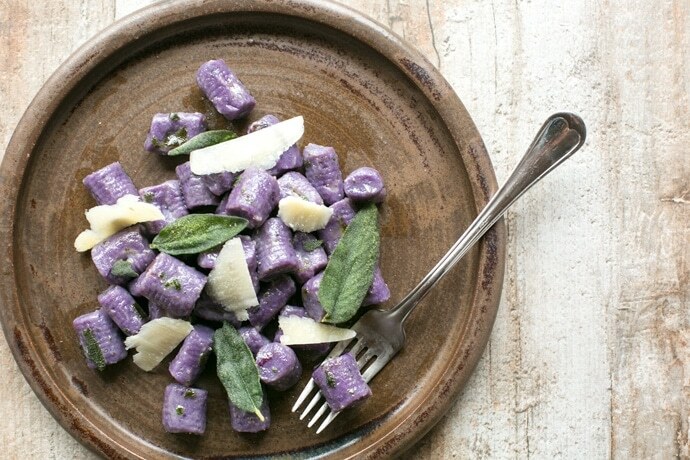 All you need to make these Purple Gnocchi with Butter and Sage is literally 4 ingredients: purple or regular potato gnocchi (homemade are best, but high quality store-bought gnocchi will work fine), butter ( YAY for homemade butter! ), fresh sage leaves and Parmesan cheese shavings. I gave a little twist to the traditional recipe and fried the sage leaves to bring out all their incredible flavour. I’ve then finely crushed half of the leaves and mixed them in the pan with melted butter, and I used the remaining fried leaves to top the gnocchi just before serving, so they keep their nice and crunchy texture. If you don’t fancy crispy yummy sage, you can totally just finely chop the sage leaves and add them to melted butter before mixing the gnocchi in. These Purple Potato Gnocchi with Sage and Butter are loaded with flavour – Soft pillowy purple potato gnocchi meet a velvety butter sauce and crunchy fragrant sage leaves to make a beautifully simple meal the whole family will be excited to dig in! These Purple Potato Gnocchi with Sage and Butter are loaded with flavour - Soft pillowy purple potato gnocchi meet a velvety butter sauce and crunchy fragrant sage leaves to make a beautifully simple meal the whole family will be excited to dig in! Bring a large pot of slightly salted water to a boil. In the meantime heat a small saucepan with the olive oil. When hot, carefully place a couple of sage leaves at the time, and fry for about 10 seconds. Remove the leaves and pat dry on kitchen paper. Crash with your hands half of the leaves and save for later. Heat a skillet over medium-low heat. Melt the butter and continue to cook until it turns slightly brown, about 1-2 min. Cook gnocchi in the pot with soft-boiling water, for 1-2 minutes until they rise on the surface. Spoon them out with a slotted spoon, mix them in the skillet with the melted butter, and sprinkle the previously crushed sage. Top your gnocchi with black pepper, the remaining fried sage leaves and Parmesan shavings, and serve immediately. I love the colours in this. We love making our own gnocchi too and Avery just loves it. The purple colour really stands out doesn’t it? Can’t wait for Noah to be old enough to try them out, if he’s anything like his mummy, I’m sure he’s gonna love them! I love the purple gnocchi, I’ve only made gnocchi once but loved it. Sage and butter sounds like a really great flavour to go with the gnocchi.